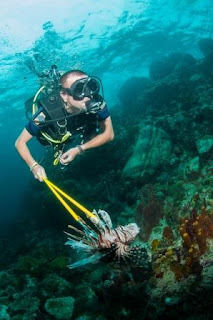 I remember the first time I saw a lionfish, I was aware of what they looked like from TV of course, and I think Captain Picard of Star Trek fame had one in his ‘space office’, but seeing one in the flesh, in the fins, was quite a surprise, they were astounding! 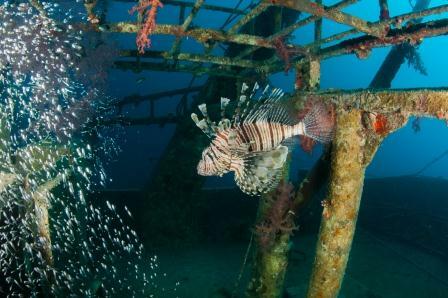 How could a fish have such an amazing collection of spines and fins, stripes and patternation? I was finning along a shallow well-lit reef and the dive guide pointed and used the symbol of both hands held together with fingers interlaced and pointed upwards and apart, that mimics the lionfishes array of spines. It took me ages to spot the fish though and the guide had to keep on pointing until my brain accepted what I was seeing as a gloriously camouflaged fish staying very still within a backdrop of soft corals. 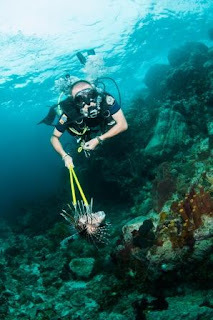 Lionfish are Indo-Pacific fish, at least that is where they are found naturally, sadly though they are no longer restricted to their native range and that’s what I’m planning to talk about in this article. If you spend any time snorkelling or diving in the waters around Florida, or in the Caribbean, sooner or later you’ll see a sign warning you about lionfish or if you’re in luck you might find a restaurant offering lionfish ceviche or lionfish southern style. 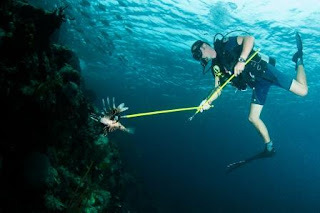 You might even witness a lionfish hunting competition that often get organised on public holidays when divers are encouraged to kill as many of the fish as possible. This is not a normal sight by any means, in the main the diving industry encourages a ‘hands-off’ approach to interactions with marine life, but in the case of the lionfish, the gloves are off and lionfish Derbies are commonplace. Before I look at how the fish are dealt with though, let’s first answer the question of how they got all the way to the Caribbean, as they didn’t make it on their own? The standard answer for many years, and I’ve heard this said time after time, is the story about hurricane Andrew in 1992. 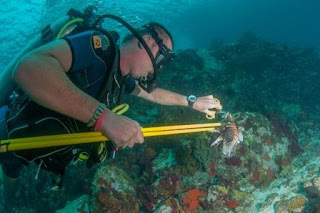 When Andrew made landfall in Florida, a beachside aquarium containing a half dozen lionfish was smashed and the fish presumably cast into the ocean. The tale goes that divers later saw the fish group in the area and thus the story has become accepted. The thing is though, there is a credible account of a lionfish being spotted in Floridian waters in 1985, well before the presumed ancestors of the ‘invasion’ ever found freedom, there had to have been previous releases from aquariums. In the Indo-Pacific lionfish numbers are controlled by predators further up the food chain, groupers and on occasion sharks will take lionfish at various stages of their growth. 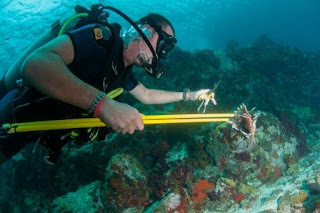 In the Caribbean, predators have no experience with lionfish and simply ignore them, allowing lionfish to chomp their way through the local fish with impunity. So far the fish have spread throughout the Caribbean region, northwards past Florida and south along the northern coast of South America, and there isn’t a ‘magic bullet’ that can remove the fish from across their new range. 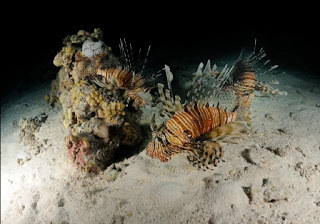 Time will tell of course, we’ll know eventually whether native predators add lionfish to their diet, but what about the species that the lionfish prey upon, what will be the ‘knock on’ effects of changes in their populations and their relative densities? Will Lionfish diets shift in response to reduced numbers in particular prey species? No one really knows what will happen over the long term. Shorter term and more immediate methods are being employed by the diving community and are receiving some support by state and national agencies across the region. The Florida Fish and Wildlife Conservation Commission, for example, regular sponsors and promoted the culls, derbies and hunts that are organised by dive centres and diving organisations in Florida waters. 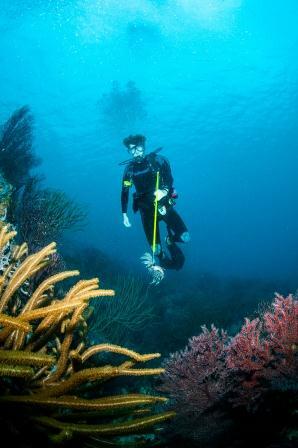 In other locales where resources and government interest may be reduced, individual dive centres have decided to take their own action to protect the fish life on their local reefs. The tool used is quite straightforward, a super sharp and barbed harpoon on a stick, propelled by a piece of elastic material the harpoon is released close to the fish, its multiple barbed tip is aimed at the body and hopefully the fish is held and killed outright. Some divers carry another harpoon so they can spear the fish twice to ensure it dies a swift death and also to allow the diver to manipulate the fish for the next part of the process. Even though the fish is technically dead, its venom is not and if the spines puncture flesh the pressure causes venom to move from glands along the spine, via ducts into the victim’s flesh: divers can get stung very easily. Some lionfish hunters will simply stuff the fish into a plastic tube, closed at one end with a one-way valve on the other that reminds me of the rubber flaps on the opening of a glass recycling bank. Back on land the tubes are emptied out and the fishy mess dealt with. I have heard these can, with the build-up of pressure, turn into what are in effect lionfish cannons (especially after being left in the hot sun), but I don’t know if this is true or not. Well It’s obviously not a complete solution, not every reef is visited regularly by teams of scuba divers, so eradication is unlikely, its more about control and damage limitation until the local fauna adapts perhaps, though it’s a long shot, but you never know. It’s an odd irony that so often stories that involve conservation issues in the marine realm return to over consumption of fish by people, but here’s a story that seems to have a happy(ish) ending when we do eat fish. And is it good to eat? I can’t deny it, its bloody lovely, especially when cooked as soon as possible after its landed. 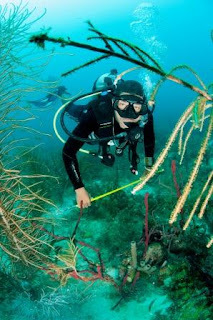 So far, its only by encouraging and advocating the catch of lionfish for human consumption, that has any measurable (even if only by a small amount) impact been made on local populations. The battle isn’t quite won though, that ficklest of problems, public perception still needs changing. There are many fishing communities in the Caribbean that are convinced that lionfish are poisonous, leaving far more valuable fish such as grouper and parrotfish still on the catch list. What are the differences in comparison with the previous years? I'm writing a cases study on Zoology (fishing aspect)at college essay assistance and need some contrasting contributions as well. Hope to find the numbers and data that show the rise or fall of the communities in the Caribbean.